This page will tell you how to increase the size of C drive to get rid of low disk space warning on Windows Server 2003 or SBS 2003. Download IM-Magic Partition Resizer Server to fix low disk space warning on C drive by increasing the size of C drive on Windows Server 2003. C drive, also known as system partition in most time, can run out of disk space along with daily temporary files, Internet temporary files and cookies, etc are stored to it. IM-Magic Partition Resizer Server, a professional partition manager designed for all Windows Server users, allows you to extend C drive when it is lacking of free disk space. When you want to increase the size of C drive on Server 2003, free disk space is needed on the same hard disk. 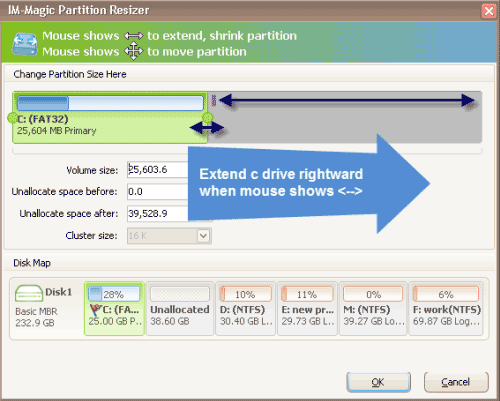 Therefore, IM-Magic Partition Resizer Server also allows you to shrink a partition in addition to extending partition. How to Increase Size of C Drive Server 2003? Download and install IM-Magic Partition Resizer Server on your computer. Run the software and then choose a partition that has a lot of free disk space. Right click this partition and go to "Resize/Move" option. You may shrink the selected partition when you see the double arrows to the left or right,and click "OK" button, then you will see the free disk space, which is shown as an unallocated volume. Move the free space close to the C drive. Right click C drive and go to "Resize/Move" option. Extend C drive when you see the double arrows and click "OK" button. Then you can click "Apply" button to complete the partition resizing. If there is no important data on the C drive, you may reinstalling operating system and format the partition to erase C drive. However in most time, C drive often contains a lot of important data when it is running out of disk space. IM-Magic Partition Resizer Server is able to increase the size of C drive without formatting the partition or deleting any data from the partition. For example, the total space of C drive is 100GB and only several GB space or even less left now, you can use IM-Magic Partition Resizer Server to extend the C drive to a larger size instead of erasing the partition. When C drive is nearly full, some uses may move necessary data to other partitions and reinstall system and then format the C drive. Once system has been reinstalled, they will move the original data back to the C drive. However, although you may fix the low disk space issue with the method, the capacity of C drive is not changed and the free space may be eaten up soon. 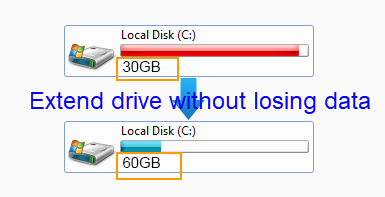 Only increase the size of C drive can you solve the low disk space problem on C drive Server 2003 thoroughly. When C drive is nearly full, you may see that C drive will show red bar. Even if Windows doesn’t pop up low disk space warning when C drive shows red bar, you can also run IM-Magic Partition Resizer Server to extend the C drive to avoid low disk space issue. Only if C drive has enough free disk space that you can keep your computer runs normally. If C drive doesn’t have enough free disk space, it may cause a lot of trouble to Server. Once Server OS break down or has any problem, it may cause loss to several computers or even more. Therefore, it is very important to make C drive large enough to avoid low disk space problem on Windows Server 2003. On a computer, it may contain more than one hard disk. In this situation, you can only move free space on the same hard disk. You cannot move free space from other hard disk to extend the C drive. If there is no free space on the hard disk, you may need to change a new hard disk. If there is free space on other partition on the same hard disk, you can use IM-Magic Partition Resizer Server to shrink the partition that has a lot of free disk space to produce an unallocated volume, and then you can add the unallocated volume space to C drive to increase the size of C drive. IM-Magic Partition Resizer is 100% safe, which doesn’t contain any virus, rogue software or Trojan. It is compatible with all Windows Server operating system besides Windows Server 2003 and SBS 2003.